Can a Xmas day be better than this? An early morning coffee with friends, visiting a remote village in Tirana, an exhausting hiking, reaching Fag summit with fantastic views towards the high peaks of Albania and the cost, beers after the success and in the end a Xmas dinner with the family. Can a Xmas be better than this? Ah… forgot to mention writing on the blog. I’m really enjoying writing and sharing this day experience. 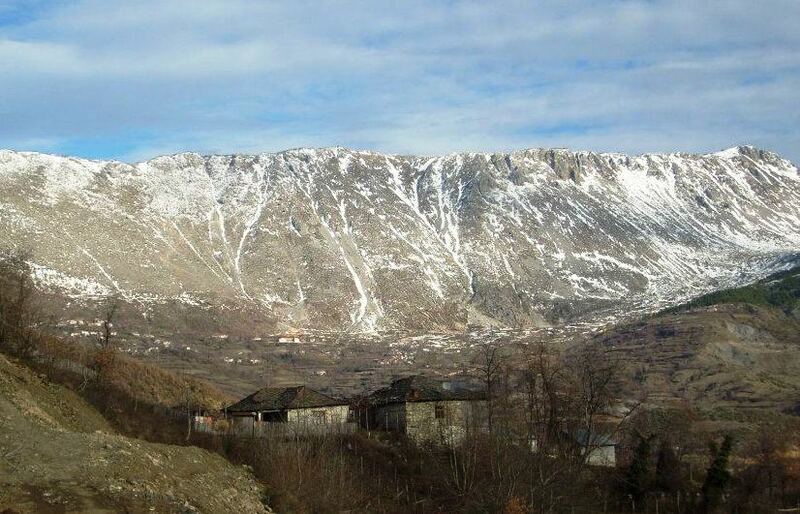 Fag is a mountain(1432m) located in east Tirana region, near Fag village, in the commune of Shёngjergj – behind Dajti Mountain. The area is well know for Mali me Gropa (the mountain with holes) but still the area doesn’t attract many tourist because of the bad road access it used to have and the lack of tourism facilities. 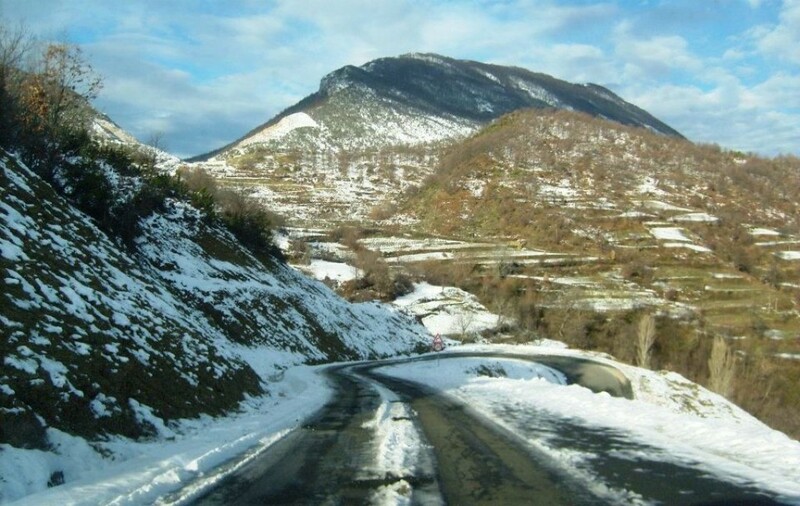 Recently a new road has been built and the area could be reached in one and a half hours from Tirana. Till now is manly visited from the adventures travels who like to see remote places and experience some wild nature but the area offers a lot in touristic terms and my feeling is that the tourism will happen soon there. Tow small bars were already popped along the new road today (Xmas 2011). The ascending was really beautiful. I’ve never seen before Shёngjergj from above because we always visit the well known Mali me Gropa and forget about the mountains which are closer to the villages. The route finding was not difficult but after the summit we lost time searching for a castle around there – as we were told a castle from Skёnderbeg time is existing some where there. We couldn’t find it and we tried to get a shortcut to the main road as the darkness was coming. In the end I have to say that this summit has fabulous views of the surrounding. I wouldn’t believe that without experience it. I suggest you to visit this area. 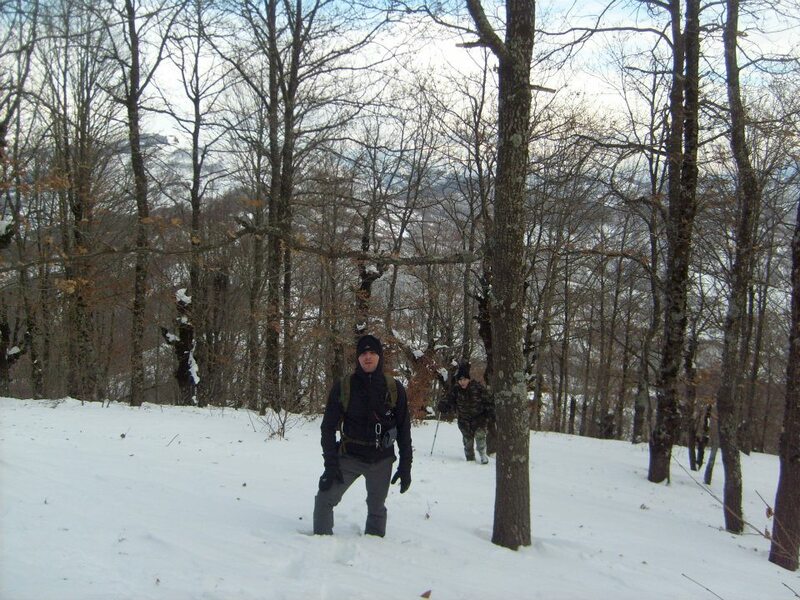 Even if you are not up to climb the mountain is worth to take a short ascending walk for a better view and why not some drinks and food in the small bars of the village and getting in contact with some locals. They really like guests. More pictures, trail description and GPS track with way-points for this hike will come soon. Take the road to Dajti National Park and turn off right at the junction before the park entrance. At the next junction take the new road (right) and take a right turn at Shengjin i Vogel village (at turn off right way-point). Take the dirt road for few meters after the parking and then take the trail in your left before approaching the houses. From here to the plateau the trail is visible. From the plateau to the peak we didn’t see any path, maybe because of the snow so we took an easy bushwhack to the summit. The summit offers fantastic views in all directions. If you don’t have a GPS device with you feel free to ask for more details. I think the route finding wouldn’t be a problem even without GPS device. For approaching the trailhead by public transport ask people in Porcelan bus station. There are minibuses from Porcelan to Shengjergj. How this hike looks to you? Are you going to take this hike? Anyways, great job you’ve done in here! Keep up the good work!